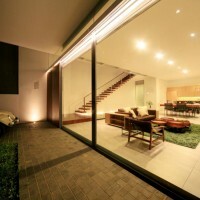 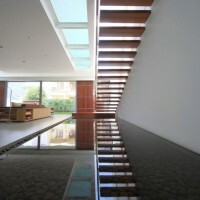 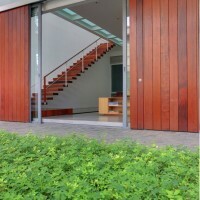 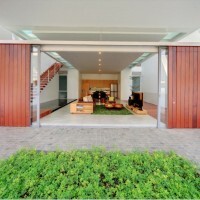 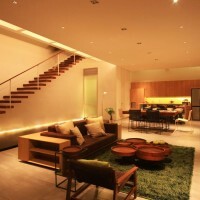 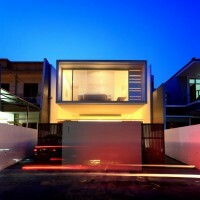 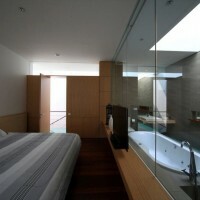 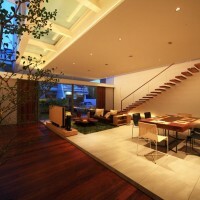 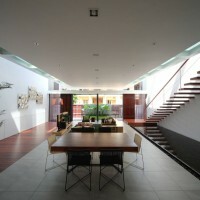 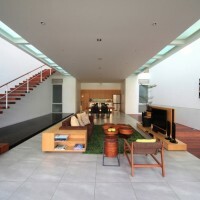 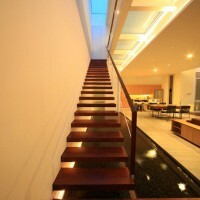 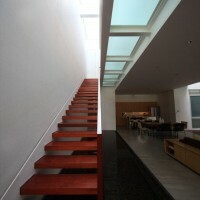 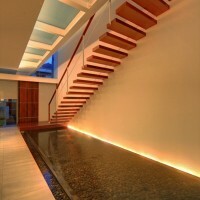 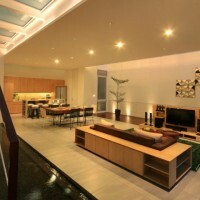 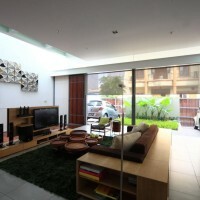 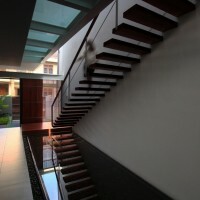 Chrystalline Artchitect designed the Satu House in Jakarta, Indonesia. 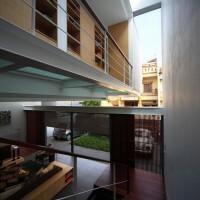 The Idea is simply to create a maximum space within its limited site. 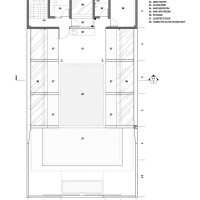 By minimising the use of wall as a partition toward the main area, so we can deliver maximum open space. 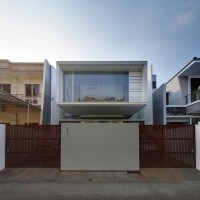 Mostly the vertical zoning activities in Indonesia urban small house put the service area on the first floor, living room-dining room on 2nd floor and 3rd floor is for bedrooms. 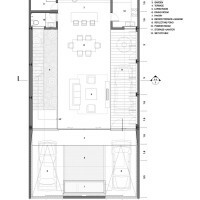 But when I started the zoning diagram, in this site I found that the first floor is actually the most comfortable level in which main activities took place. 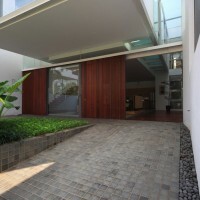 In terms of owner’s mobility access and potential view from the front yard, the first floor has some advantages that we can’t have on the upper floors. 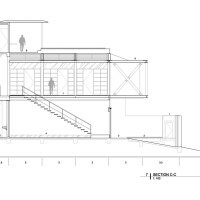 So I decided to switch the composition by placing the main area on the first floor and service area on the 3rd floor/ roof floor. 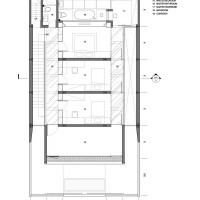 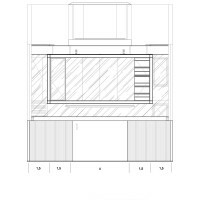 When designing the section of living-dining area, I realized that this site which has 10 metre width is possible to have a clean space without column by hanging the bedroom level to the main beam on the roof floor that be spread out along the site’s width. 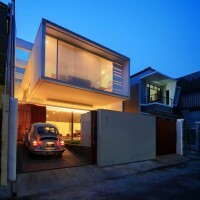 Therefore I use the steel structure to build the main structure of this house. 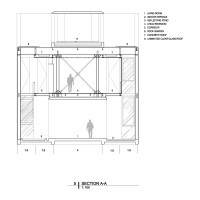 The entire main structure has been preliminary assembled on the workshop before it’s been constructed on the site, to ensure all the steel joint detail were design and worked perfectly. 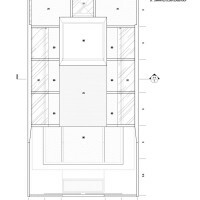 Large dimension beams that been required gave me a chance to optimize the height of the beams to place ventilation grill between each of it. 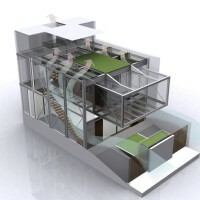 Those ventilations provide circulation for hot air to flow out with roof glass at the left and right side of the building to bring natural light for the house during the day. 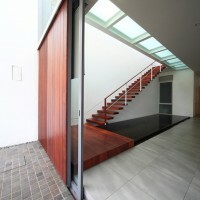 The second floor, where all bedrooms are placed has a multifunction space right beside the stairs that’s been used as corridor, library and entrance door for bedrooms. 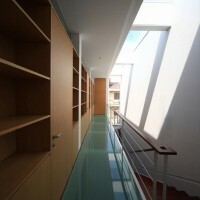 The book cabinets also become partition for each bedrooms. 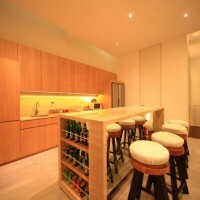 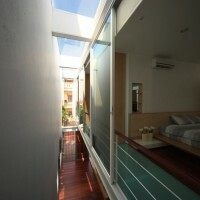 At the opposite side, there is another corridor as the connecting area for all bedrooms and multi purpose room that placed in linier order. 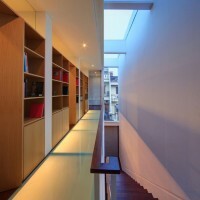 When all connecting doors at this corridor are opened, the rooms unite into one big connected room. 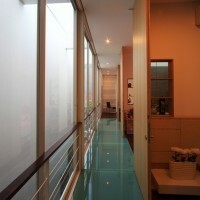 Frosted laminated glass is applied for both corridors to provide larger range of light for living area on the first floor. 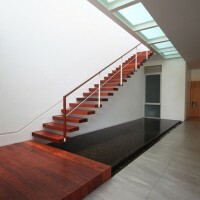 I put reflecting pond under the stairs to decrease the room temperature during the day and create a peaceful ambiance by listening to the sound of water stream. 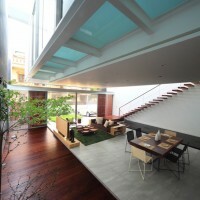 An indoor terrace with wooden floor at the right side not only being used as a playground for the children but also can be an occasional indoor garage. 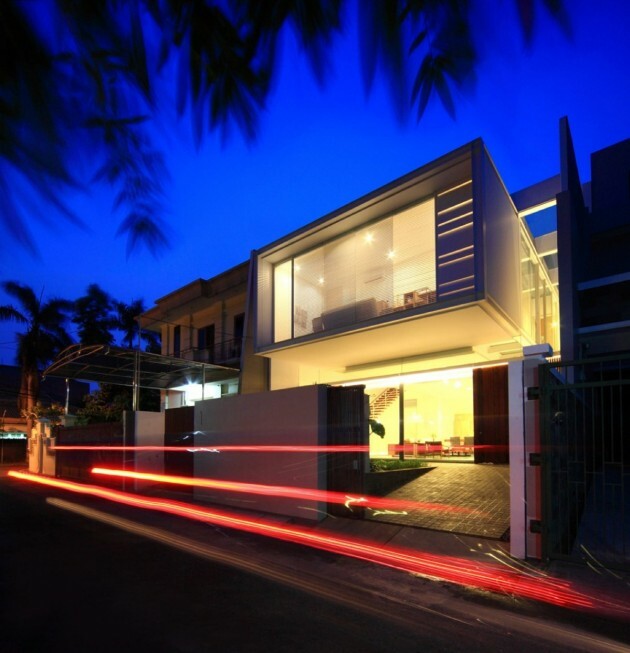 As a whole composition, ‘Satu House’ was designed as a smart and thoughtful idea in terms of optimized the use of space for limited site. 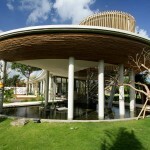 Visit the Chrystalline Artchitect website – here.